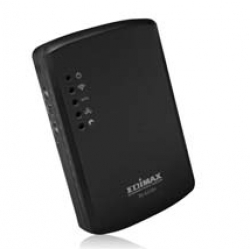 The Edimax 3G-6210N Portable 3G wifi router allows you to share your mobile broadband connection to whoever you like, securely. They can be taken with you when you are out and about and run off the supplied rechargable internal battery or powered/charged from the mains like a traditional broadband router. simply plug in your dongle (see compatibility list here) follow the simple, supplied cd instructions and you are away. The main reason this is interesting to us is the fact it is unlocked, meaning there is no tie in to a certain network or contract, it will work with 99.9% of dongles and works with all networks. Connect the 3G/3.5G USB modem card to 3G-6210n router USB port. Share the Internet connection by connecting wired or wireless computers. ** You can switch Ethernet port as a WAN port, and connect 3G-6210n router Ethernet port to your cable/ xDSL modem as a backup.